To create your own link, use https://wa.me/ where the is a full phone number in international format. Omit any zeroes, brackets or dashes when adding the phone number in international format. For a detailed explanation on international numbers, read this article. 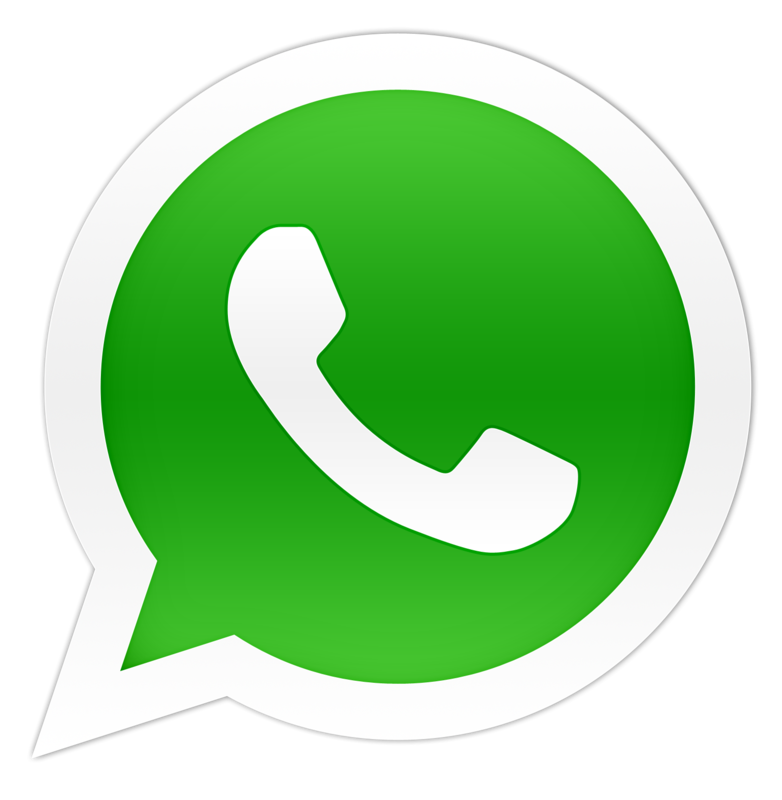 Please keep in mind that this phone number must have an active account on WhatsApp. Always prefix 91 on Indian number . Do not add +91. 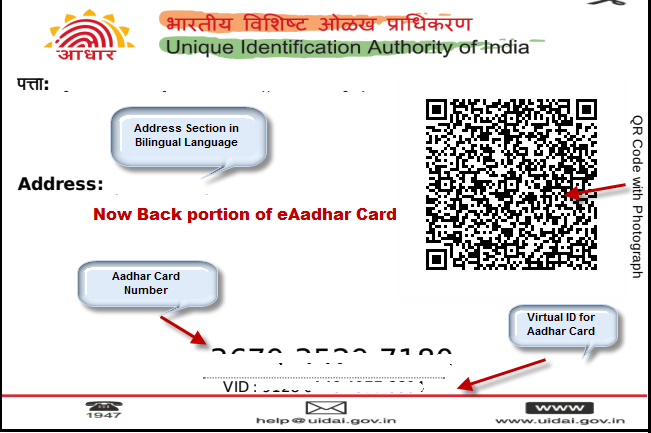 UIDAI has introduced an new updated 'QR code' on Aadhar card which will now have details like name, address, photo, and date of birth.Earlier Photograph was not embeded in QR code .For offline user verification can be done without providing the 12-digit aadhar number. number. This would be especially handy for establishing the identity with non-statutory entities, say, the likes of online shopping portals when delivering goods. Aadhaar holders can download and print their biometric ID with the QR code from the website of Unique Identification Authority of India (UIDAI) or its mobile app. A QR code is a form of barcode label which contains machine-readable information. Users can manually blacken the Aadhaar number and use the printout with the new QR code for establishing their identity, offline too. For example, when an online shopping delivery delivers the item and delivery man asks for ID, Aadhaar holder can show him the printed QR code which when scanned (through an updated QR code reader on Aadhaar site) would read non-sensitive information.With this name, address, date of birth and photo, can be feteched and thus easily identity, It will also ensure that Aadhaar holder is genuine and not using any tampered ID documents. Ajay Bhushan Pandey, CEO of Aadhaar-issuing body UIDAI, said: "The offline QR code is a landmark development which will allow everyone to establish their identity through offline verification without giving out Aadhaar number". He added: "Only in those places where Aadhaar number is required under the law including banks, telecom companies, or for availing subsidies, one will have to go through the authentication process. Currently , Trai will be collecting extensive feedback from the public, and in the future, the regulator will add all the circle plans in the portal, but it’s going to take a while. As of now only operators of DELHI circle is added . 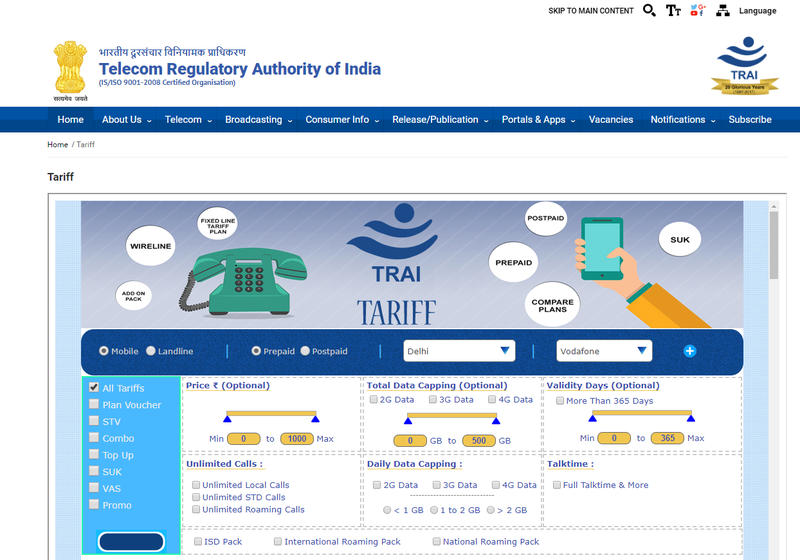 Trai has made this website in downloadable format where user can download the tariff in excel format This would help the consumers do a comparative analysis. The stakeholders and public should give Trai the feedback on the initiative within 15 days. The feedback could be of the look, feel and utility of the portal. Post the feedback, Trai will be add other circle’s tariff plans. you’re looking to link your mobile number with Aadhaar with the new IVRS method, here’s how you can do it. 1) Dail 14546 from your mobile phone and wait for the IVR voice. 2) Once the call gets connected, you will be asked to select the language. Select language as per the instructions. 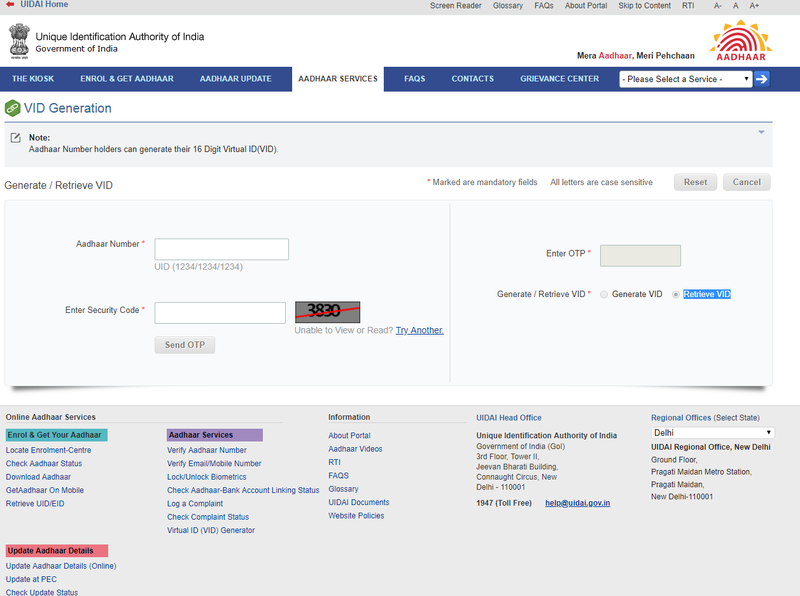 3) Now, you will be directed to enter the Aadhaar number. Once after you entering the Aadhaar number, telecom operator will send the Aadhaar details entered by you to UIDAI for verification. 4) Once verified, you will receive an OTP, which you need to enter during the call itself. After entering the OTP, the call can be disconnected. After that, you will receive a confirmation SMS. Now a days 12 digit Aadhar is very important to Indian citizen.Various service is using aadhar authentication to verify the identity like SIM connection ,Gas Connection or even in some digital payment. 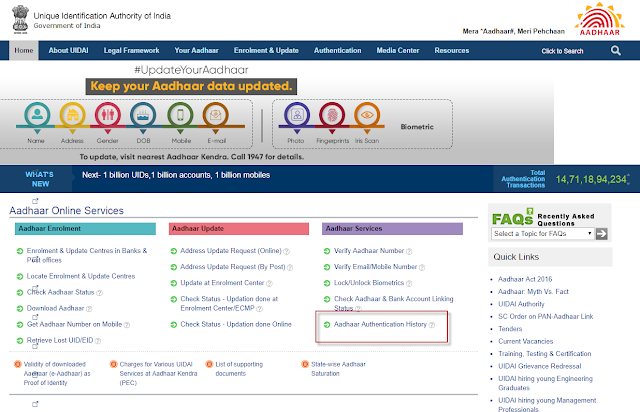 UIDAI has make the provision to view the history of authentication where citizen has made. This enable citizen to make aware of any unwanted authentication that he/she has not done. Here is simple steps by which you can access authication history. 3) Click on Generate OTP button. The page that opens, contains specific authentication request types such as biometric, demographic, and so on from the filter option. It also allows you to select the date range — but only up to six months before the current date. Once OTP is verified, you will be able to see a detailed list of Aadhaar authentication requests. Here, you can check the date, time, and type of authentication request. 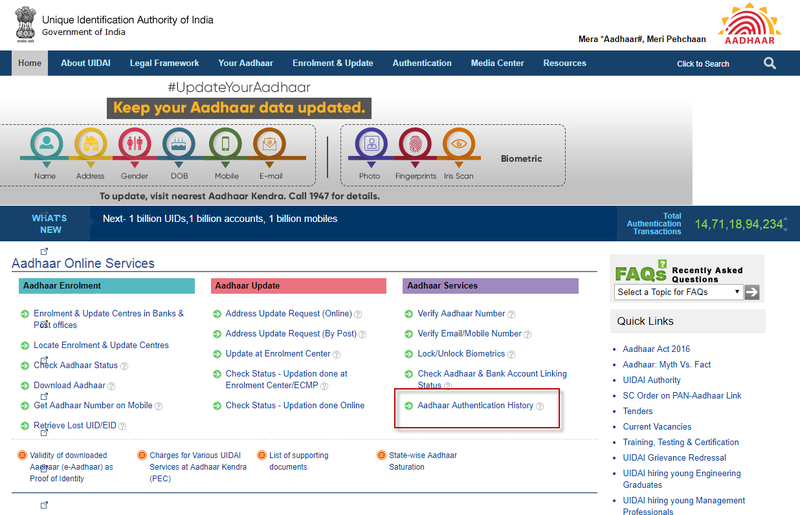 In case you see any Aadhaar authentication data which was not requested by you, you can raise the issue with UIDAI. In this era of Digital era Google has introduced a new payment apps. Please do not confused with wallet. This is not at all wallet . This is UP based Payment method. This apps pay directly from your bank account, that means your money is safe with your bank and you’ll not going to lose intrest. Here user no need to open a separate account or worry about reloading wallets. It uses your Google account to get registered. It provide two leyer security one for Google account PIN and another for UPI PIN. This Google PIN do not reside on your mobile apps. This Google PIN reside at Server end. Tez uses UPI (Unified Payments Interface) and works with all major banks, including our partners: Axis, HDFC Bank, ICICI and State Bank of India. 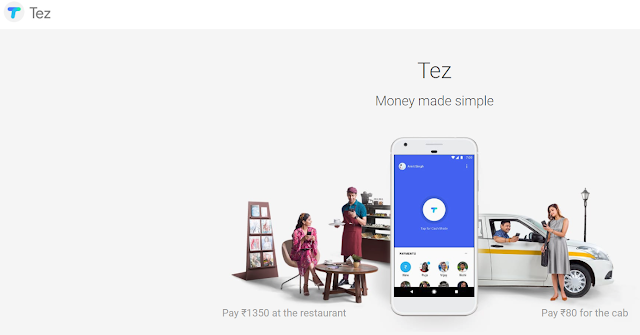 Tez makes it faster and more secure to pay on apps and websites – anywhere that UPI is accepted. When you check out, look for the Tez logo or use your Tez UPI ID. Currently Tez supports all major Indian banks and smartphones with KITKAT or Above . It language support for English, Hindi, Bengali, Gujarati, Kannada, Marathi, Tamil, and Telugu, sending money is easy to understand. This apps also suits the Business need . Shop Owner can use the Tez app with their individual bank account to start accepting digital payments today. Payment goes directly to your bank account . There is no fees for such transaction . The most intresting feature of this apps is its CASH mode . This mode enables you to send money without sharing your phone number/email id or any bank detial or any UPI detail. In this mode user need to enable cash mode in apps. As soon as user enable it the mobile phone generate a Utrasonic Audio QR code which is to be recived by reciver end. Here Reciver also need to enable cah mode to recive the fund. Once the reciver reciver get the audio QR code then sender and send the money. Please note this not based on NFC technology and neither you require any specific feature enabled smartphone. All you need a smartphone with mic and speaker. Please do visit Google Tez youtube channel to understand better.